Looking for answers to your legal question? Pike Law focuses on Car Accidents, Criminal Defense (DUI, Drugs, Traffic, Domestic, Theft, Arson, Homicide), and Social Security Disability. Attorney John B. Pike has been representing clients in Kingston, PA and throughout the surrounding Northeastern Pennsylvania area for over 25 years. 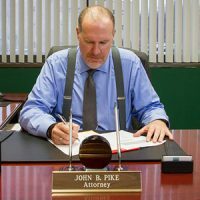 John B. Pike, Attorney at Law offers legal services across a broad range of practice areas, with a particular focus in Car Accident, Criminal Law and Social Security Disability cases. If you have been charged with a crime in Pennsylvania, you need an experienced criminal defense attorney on your side. For more than 25 years, attorney John B. Pike has been fighting to defend the rights of accused clients. He has built his reputation on getting results. Intimately familiar with all facets of the Pennsylvania criminal justice system, John Pike has the knowledge and skill to make sure you understand your legal options and to guide you through the legal process.